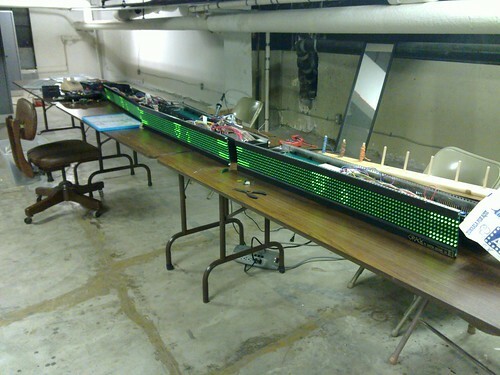 The green 12' long (in 3 segments) LED scroller sign that Travis has been hacking on is looking AWESOME! He's got a half brightness feature implemented, and is now driving all 3 sign segments off of a single arduino microcontroller. The sign is neat in that there are 3 parts that plug together (it was some sort of expandable system.) The control software was DOS based, and the original control board set never worked right. Some mods were needed to each module to make it go. Overall though, it's looking great. The new code on the arduino controller will support using the sign as a frame buffer from another computer, and Enferex (Matt) has something wild in store for it! I think it is an awesome project. I wouldlove to see it and help on the project.